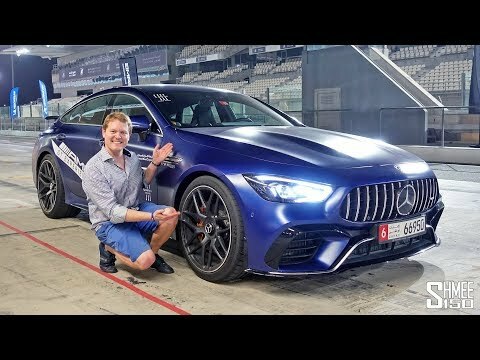 Pushing the Mercedes AMG GT 63S 4-Door on the Race Track! > Shmee150 | 히든-카를 찾으세요! Pushing the Mercedes AMG GT 63S 4-Door on the Race Track! Let's discover the brand new Mercedes-AMG GT 4-Door 63S under the floodlights of the fabulous Yas Marina Formula 1 circuit in Abu Dhabi! For my first ever drive on the famous Grand Prix track, I join Mercedes-Benz Abu Dhabi of the Emirates Motor Company for an event featuring the new 4-Door family member from AMG. As the first time the car is available to be driven in the GCC region, there's a good opportunity to push the 639hp super-4 seater through it's paces. With a 4.0l twin turbocharged V8 from AMG it's also producing 900nm of torque, which combined with 4Matic+ and the 9spd AMG Speedshift means it's capable of 0-100km/h in just 3.2 seconds despite its 2,075kg weight! There is no question it mixes the sporty looks of the 2-door AMG GT with the convenience and tech levels of the likes of the E63 S and the CLS models. Having previously driven the AMG GT 4-Door 63S at Circuit of the Americas in the USA, will it impress just as much on track for my second outing, this time across the world in the UAE? Let's find out, again with huge thanks to the team at Mercedes-Benz Abu Dhabi. The FIRST McLaren Senna EVER on the Nurburgring! Importing a Shelby GT500 to the UK? My Ford GT on the Nurburgring for the FIRST TIME! Snow Ruins My Ford GT Nurburgring Plans! The First HIGH SPEED Drives in My Senna and Ford GT! Ferrari GTC4Lusso - Here's EVERYTHING You Need to Know! My First Drive in the AMG GT R Pro! Is this the Greatest Supercar Display Ever!? 6 of My Cars in 1 Big Truck! My Senna Visits the McLaren Factory for a LEGO SURPRISE!